How can you track your progress as a leader? Jennifer Bridges, PMP, shows you how to set up leadership key performance indicators (KPIs) to do just that. Here’s a screenshot for your reference! Before you can track your success as a leader, Jennifer said, you must know what a leader is. That, she explained, is a person with the ability to lead a group of people towards achieving a common goal. But how do you know you’re succeeding in that task? And how can you get better? Well, she noted, you can’t improve what you can’t measure. That’s where tracking tools and key performance indicators (KPIs) come in. Jennifer quoted leadership coach and mentor Dr. John Maxwell, who said, “People buy into the leader before they buy into their vision.” That means before the leader can direct the group, the group needs to trust and be willing to follow the leader. Therefore, KPIs are a great way to measure how people are responding to the leader. It tells you not only how the organization is doing, but how others feel about the leader of that organization. Align your priorities to the business. Transfer your vision to the team, so everyone understands it. Manage your brand, which are the strengths you bring to the organization. Dress for success, because looking the part is part of leadership. Develop your inner circle to offer guidance and advice. Manage stakeholder expectations by keeping them informed. Become an influencer to better guide those following you. Lead with confidence but not arrogance. Maintain a growth mindset and never allow complacency. Develop a personal growth plan to avoid becoming stagnate. Pro-Tip: Of course, there’s more to becoming a successful leader. There are certain traits that all leaders have in common. If you don’t have one or more of these, don’t worry. People aren’t always born leaders, but leaders always learn. 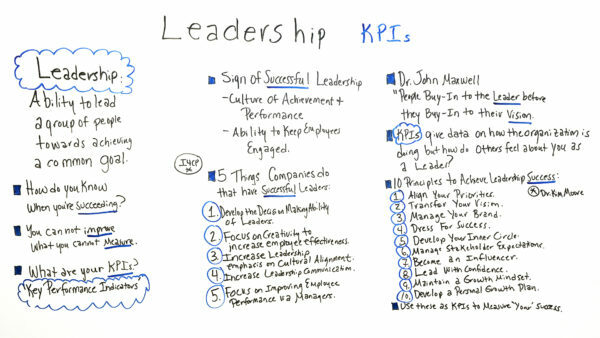 Today, we’re talking about leadership KPIs. So in this whiteboard session, I wanna talk about the sign of successful leadership. I also wanna highlight five things that companies do that have successful leaders. And, I wanna talk about 10 principles for leadership success. But first, where I want to start is I wanna talk about what leadership really is. It’s the ability to lead a group of people towards achieving a common goal. So, how do you know when you’re successful? Well, you cannot prove what you cannot measure, that’s where KPIs come in. KPI is a Key Performance Indicator. So the sign of a successful leadership is a culture of achievement and performance, and the ability to keep employees engaged. So I4CP has five things that companies do that have successful leaders. First of all, they develop the decision-making ability of the leaders. They also focus on creativity to increase employee effectiveness. They increase leadership emphasis on cultural alignment. And, they focus on improving employee performance via managers. So if through leadership you’re trying to guide a group of people towards a common goal, you have to get them to buy into you as a leader first. So looking at a KPI, the Key Performance Indicators, they give data on how the organization is doing. But, you have to consider how did the people or the group that you’re leading feel about you as a leader? Well, here’s where the 10 principles come in. So Dr. Kim Moore of the John Maxwell leadership group highlights these. So the first one is to align your priorities. So what that means is you’re lining your priorities to the business or the company objectives. You also wanna transfer your vision, let the people that you’re guiding know what the vision is of where you’re growing, whether it’s a project or an initiative. And let them be part of the vision, let them know why they’re important to the vision, and how their strength contributes to your success. Also, number three is manage your brand. And that’s based upon the strengths that you bring individually and uniquely to the organization. Number five is develop your inner circle. It does matter who you surround yourself with, so surround yourself with other successful leaders that you can learn and grow from. Also, number six, manage stakeholder expectations. So if you can do that, keep people informed, communicate with them, that makes a big difference. Number seven. Become an influencer. Be able to impact and influence the people that you’re guiding. Lead with confidence. Again, if you’re using your strengths and know what your abilities are, and you also leverage other people in the group or the organization to compensate where your weaknesses are, that makes a big difference. Number nine. Lead with a growth mindset. Always be open to learn. There’s always new things to learn in our industry and us personally, and in our development. And number 10. Develop a personal growth plan. Always plan to strengthen your strengths and develop your growing edges. So we believe that growing and developing is a plan, it’s a project, it’s one of your most important projects. So if you need a tool that can help you with your leadership KPIs, then sign up for our software now at ProjectManager.com.